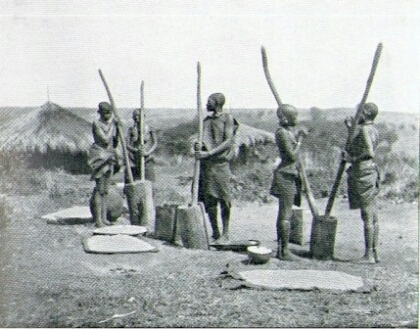 Gĩkũyũ traditional porridge or gruel, ũcũrũ, was the main pillar for maintaining the healthy life of the Gĩkũyũ just as fermented milk was the main pillar for the pastoralist communities like the Maasai. The operative word here is fermentation for it is unlikely that any society anywhere in the world could have failed to discover that a healthy life is impossible without the incorporation of fermented products in the diet. Today’s human health crises all over the world can be attributed mainly to the abandonment of traditional fermentation practices. It is becoming increasingly obvious to health researchers and practitioners that the maintenance of a healthy gut ecosystem requires a careful management of internal fermentation and that it benefits greatly from ingested fermented products that are teeming with microbiota. A look at pictures of the Gĩkũyũ and Maasai taken at the beginning of the Twentieth Century when they came into contact with civilization show a people who were exceptionally healthy. Obesity and other diseases of civilization were unheard of. The skin, teeth, hair and other health indicators can be studied even today among people who have kept a healthy distance from Western civilization. There were two types of porridge: gĩthambio, and mũkiyo. Both were made from the same ingredients, millet, sorghum or other varieties of grain. Maize was introduced into Gĩkũyũland at the beginning of the 20th Century from the Americas. Gĩthambio, was fermented first, cooked later and drank hot. Mũkiyo was cooked first left to ferment, and drunk cold. Gĩthambio, which literally means “the great cleanser” was considered inferior to the real “ũcũrũ wa Gũkiya” . 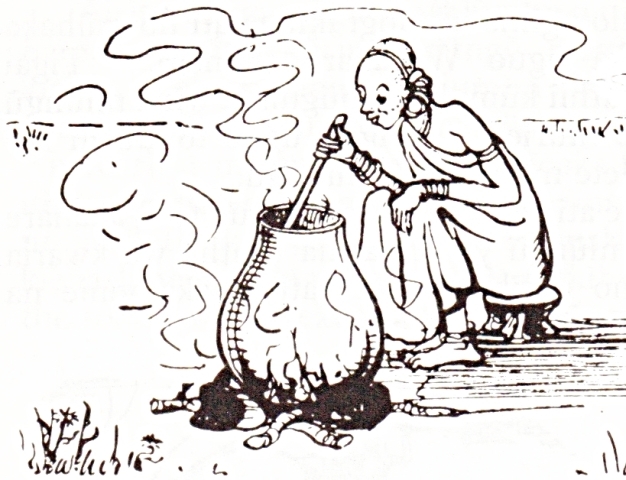 Gĩthambio was simply taking flour and water, mixing them and putting the mix in a gourd where the mix fermented slowly. After two or three days a calabash of this fermented mix will be used as a starter for a cooked porridge meal. As the gourd gets low of the fermented mix, more is added and the process goes on and on. It is akin to managing the starter for pancakes that New Englander’s are so famous for. Making the real ũcũrũ, mũkiyo is a bit more complicated as the process is done with a lot of personalised nuances. Ucũrũ is the woman and a woman is known by her ũcũrũ. When maize made its entry into Gĩkũyũland, the process of making ũcũrũ moved a notch higher. The young maize, not too soft but “al dente”, is first crushed with a pestle and mortar. The crushed mix is then put in water and the milk extracted by pressing the mix between the hands. The semi dry mix is further ground using a grinding stone and more milk is pressed from this fine ground flour. All the milk is then seasoned with a finely ground millet or sorghum flour. The seasoned milk is then warmed to near boiling in a clay pot while constantly being stirred and then removed from the fire and left to cool. It is then transferred to a fermentation clay pot and covered. After two or three days, this porridge is ready to be served – cold – in half calabashes. It is easy to see why this was the crème de la crème of Gĩkũyũ ũcũrũ, the real ũcũrũ wa gũkiya. Because Gĩthambio is cooked to a boil after fermentation, most of the active microbiota is killed but in mũkiyo, the microbiota is fully active and thriving even as one drinks and transfers all this fermentation into the gut. 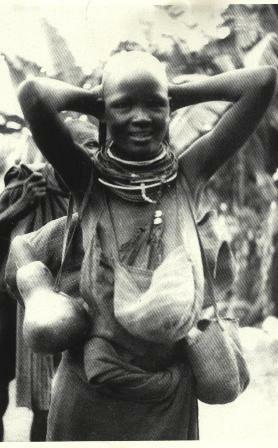 While hot Gĩthambio was usually drank only for breakfast, the cold variety was drank at any time of day. Most people carried a gourd of the cold ũcũrũ as a thirst quencher while travelling and also while working in the fields. It was not given to babies however. One year old children could be introduced to the hot gĩthambio but never to the cold ũcũrũ. This was for those who had been born a second time. Gĩthambio, was also used to cleanse a building site before construction commenced. It was also used in many other cleansing ceremonies. The health train of modern Gĩkũyũ which is mindlessly hurtling to an apocalyptic vision 2030 will be halted and redirected if they are willing to listen to their ancestors. The only way to listen is to take the difficult step of saying no to the miseducation of the medical-pharmaceutical cartel or what Ivan Illich called the medical establishment. He opens his book, Limits to Medicine, “The medical establishment has become a major threat to health.” Written in 1976, this is an understatement today. Was he writing it today I am sure that the opening sentence would read, “The medical establishment is the major threat to health.” Not has become a major threat, but is the major threat. Take ũcũrũ. Ní ndakena kúmenya onakorwo menete úcúru takíndú kíngí. Well, you are telling me! I am happy to know even if ūcũrũ is not my cup of tea. Maitu! I hope you don’t intend to be a nursing mother with tea. 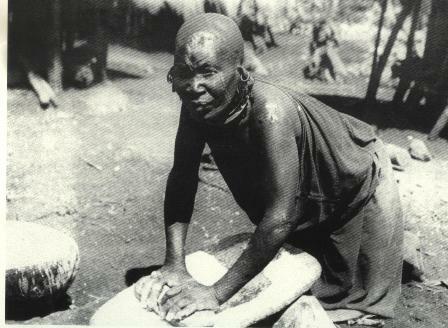 All Gikuyu women drink Githambio for their health and that of the baby. Pleeease! I totally agree on UCURU and particularly fermented one.We see fermentation also being replicated by other tribes like Mursik in Kalenjin. So lets feed wean our children with UCURU and will do away with health issues. If only I knew how to make fermented ucuru, if only my cucu lived with me! Would save me lots of money! Kambucha, which is fermented tea is rather expensive, I can’t keep up,my good bacteria has really benefited from this new info! Thumbs up! Ezzyie, making Ucũrũ is not space science. Mix some stone ground millet or sorghum floor with clean water in a bowl an store in a cool place. Within a few days your precious bacteria will begin to grow. Use this as a starter for the cooked version described above. Good luck! Great article. I grew up drinking ucuru. My dad is 95 still can do a lot. He was raised taking githambio as well as múkio, gwaci na nduma. Múkimo wa njahî na nyama cia mburi. I hope i will see him still in his 120. He isnt under any medication. Thanks Wa Maori for your comment. We are sure your Dad’s great health can be attributed to his traditional diet. The whole of Kikuyuland is ailing and wailing due to an inability to manage sugar. Few like your dad will be saved the plague of cancer, diabetes and heart diseases. It is so sad because they cannot listen let alone believe the wisdom of your father. Vision 2030 is apocalyptic indeed. I remember my grandmother used to make the ucuru wa gukia, and then she would put tatha in it. No one would drink apart from her agemates. Mukuyu can you research on the use of tatha as a source of food. Thank you for your appreciation of our work and the mention of taatha that green stuff found in goat and cow stomachs. Like githambio the great cleanser, it was also used a lot in sacred ceremonies. We will write about it. Thank you again.